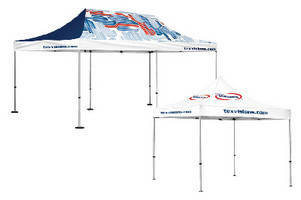 Commercial-Grade Advertising Tents come in 3 sizes. Available in 10 x 10, 10 x 15, and 10 x 20 ft sizes with multiple options for customization, Advertising Tents feature truss configuration frame with hexagon-shaped telescopic legs for stability. Tents provide 6.5 ft above ground space for walking or standing, with peak that reaches max height of 10.5 ft. Canopy and walls are available with full imprints, area imprints, or no imprints. Walls come as solid pieces with 100% coverage, or can have windows added for visibility. Carlisle, Pennsylvania — Tex Visions introduced new Advertising Tents in three sizes on Thursday. Advertising Tents are commercial grade tents made for long-term use. Three sizes are offered, 10’x10’, 10’x15’, and 10’x20’ with multiple options for customization. The frame consists of a premium truss configuration to keep the canopy secure while the telescopic legs use their hexagon-shape to maintain stability. With 6.5’ above ground space for walking or standing, the Advertising Tent will command attention with a peak that reaches a maximum height of 10.5’. For the canopy and walls, the options offered are full imprints, area imprints and no imprints. Area imprints and no imprints (white) are great for those who are trying to save money but still want the presence of a large display. Walls come as solid pieces with 100% coverage or to keep visibility, can have windows added for a unique look. Half walls are ideal when a barrier is required but open space is wanted for interaction. Additional accessories such as Steel Weight Plates for added support in windy conditions and a Trolley with Wheels for easy transportation make our Advertising Tents top notch! Tex Visions is one of the world’s leading manufacturers of display hardware and custom printing. They specialize in custom textile printing. Tex Visions offers the latest high quality innovations for indoor and outdoor displays, including flags, banners, P-O-P and more. The company’s exclusive products include the Bowflag®, T-Pole® and Q-Frame®. To learn more about Tex Visions, visit www.texvisions.com.